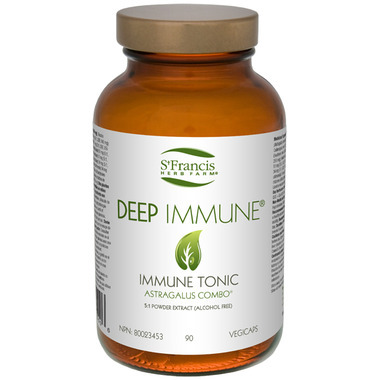 The herbs that make up the Deep Immune have an affinity with the immune system. They can act as an immune tonic, which improves the vitality of the immune system, a stimulant, which boosts immune function, or a modulator, which helps to rebalance the immune system, strengthening weak or unresponsive function such as occurs with colds and flu and calming overaggressive function such as happens with allergic responses. Deep Immune encompasses all of these immunological roles. Suggested Usage: Adults: 2 capsules 3 times per day. Medicinal Ingredients (per 340 mg capsule): Astragalus root (Astragalus membranaceus) 68 mg (5:1, QCE 340 mg); Codonopsis root (Codonopsis pilosula) 51 mg (5:1, QCE 255 mg); Eleuthero root (Eleutherococcus senticosus) 51 mg (5:1, QCE 255 mg); Reishi mushroom fruiting body (Ganoderma lucidum) 51 mg (5:1, QCE 255 mg); Ligustrum fruit (Ligustrum lucidum) 34 mg (5:1, QCE 170 mg); Schisandra fruit (Schisandra chinensis) 34 mg (5:1, QCE 170 mg); White Atractylodes rhizome (Atractylodes macrocephala) 34 mg (5:1, QCE 170 mg); Licorice root and stolon (Glycyrrhiza glabra) 17 mg (5:1, QCE 85 mg). I love this product! Our family takes it (kids take liquid form) and we're getting much less colds this winter! This product boosts your immunity. I only consume in the winter months. I havenâ€™t had a cold or any other virus when using this product. This product is a life-saver, especially during cold season. I recommend it to all my friends! was recommended to me by a friend and i take it all the time now to help boost my immune system. had a rough cold season this year and this has helped a lot. great product. glass container not plastic. great price. Have used this product for several years especially during cold and flu season and it has helped ward of colds and flu for me. Happliy Healthy!! I have had my family of 4 on a daily routine of Deep Immune since our natural path suggested it 2 years ago. I run a home daycare so this has become our ultimate germ defence. I have been taking this product for several years and have seen a definite boost to my immunity.